This trunk show is open to anyone in the UK, Canada or the US. The prize fund currently stands at £50 or the equivalent in dollars. 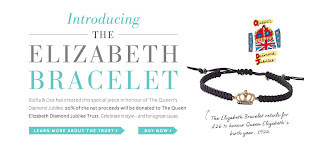 The most popular item so far is the Elizabeth bracelet which retails for £26, the year our Lizzie was born and costs £2.95 to ship/post. The lovely Florabel who lives in California emailed me today to say she had received hers! Place any order on my Stella & Dot website between now and June the 3rd and you will be in with a chance to win free jewellery from the lovely Stella & Dot range as featured in Vogue, Grazia etc.